Potato salad is one of The Husband’s favorite things especially when you are pairing it with BBQ. I am not a huge fan of most versions since they are often so high in fat and honestly just not worth the calories you have to spend for such a small serving. One of my favorite things to do is to take a fattening favorite and make it healthier. This is how I came up with my healthier version of Potato Salad. The only problem now is that he requests this instead of the convenient store bought kind…..hmmm, I guess it’s better to make it for him from scratch though, right? Place potatoes in a saucepan, and cover with water. Bring to a boil. Reduce heat; simmer 10-15 minutes or until tender. Drain. Cool and peel. Cut potatoes into 1/2-inch cubes. Place potatoes in a large bowl. 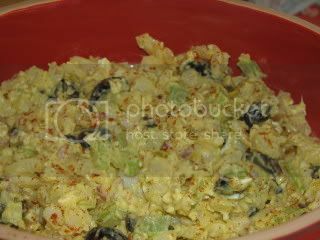 Add celery, onion, pickles, garlic, pickle relish, olives, and eggs; toss gently. Combine mayonnaise, mustard, salt, hot sauce (if using) and pepper. Spoon mayonnaise mixture over potato mixture; toss gently to coat. Sprinkle with paprika. Cover and chill 1 to 24 hours. Yield: 8 servings (serving size: 1 cup) – 6 points+ per 1 cup, vs 8 for a 1/2 c of the real deal. ooh, I like the addition of eggs in this. the egg yolks make it so creamy, and yolks are healthy, too! Hi Burp ~ love the name! I never thought about that with the yolks, but, you are right – they do make it creamier. Hi Danica, I have been gone for quite awhile, but now I am back and am again in Weight Watchers, and Have lost 12 lbs so far, and I am re signed up for your web page, Really missed you! First question on your Potato Salad, my hubby is more the dill pickle eater,I was just wondering if I can use them instead of the sweet ones? And instead of Hot sauce ,use Topatio? Thank you so very much! Welcome back! It’s always great to hear from you. Yes, you could easily use dill pickles/pickle relish and Tapatio is what I use for my hot sauce dashes. I have used the Best Foods Mayo that is made with olive oil as another option for a Mayo that excludes dairy.